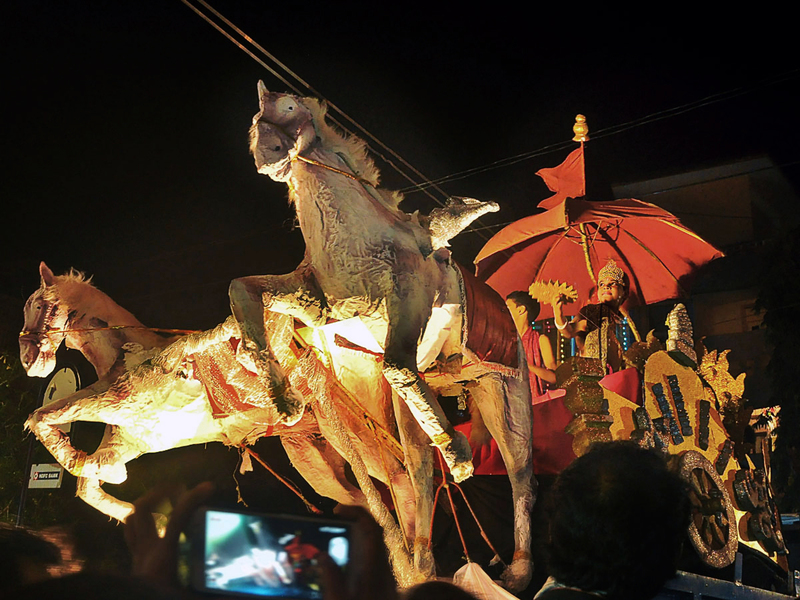 Beautifully made effigy of Narkasura in a procession during the competition organized by institutions of Goa. This procession goes till early in the morning. 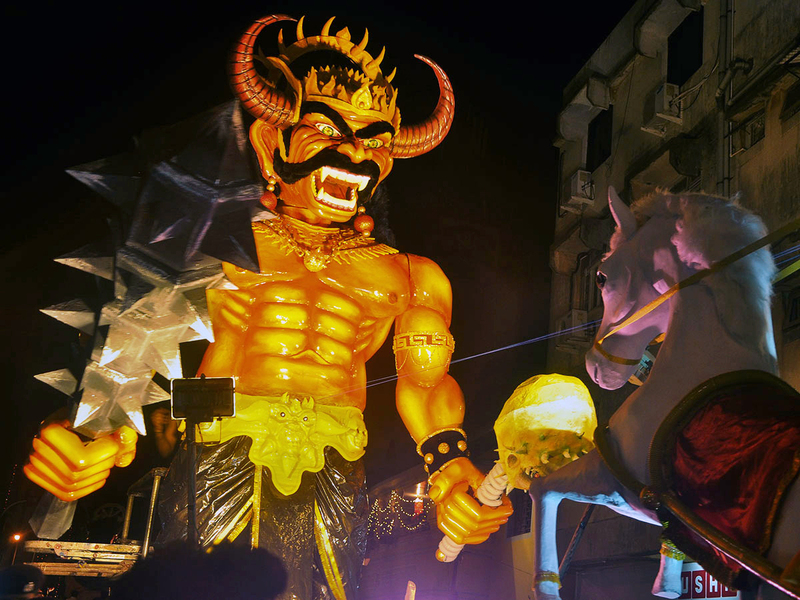 During the procession people create an impressive scenario of killing Narakasura, the best moves and creative effigy wins the first award. People from all age group join in making this activity happen successfully and enjoy the festival. In the procession not only effigy of Narakasura is involved but also other supporting characters from the story of killing Narakasura take place. People spend lots of effort and money in creating chariot, mask, lighting and drapery to make the scenario look effective and impressive. 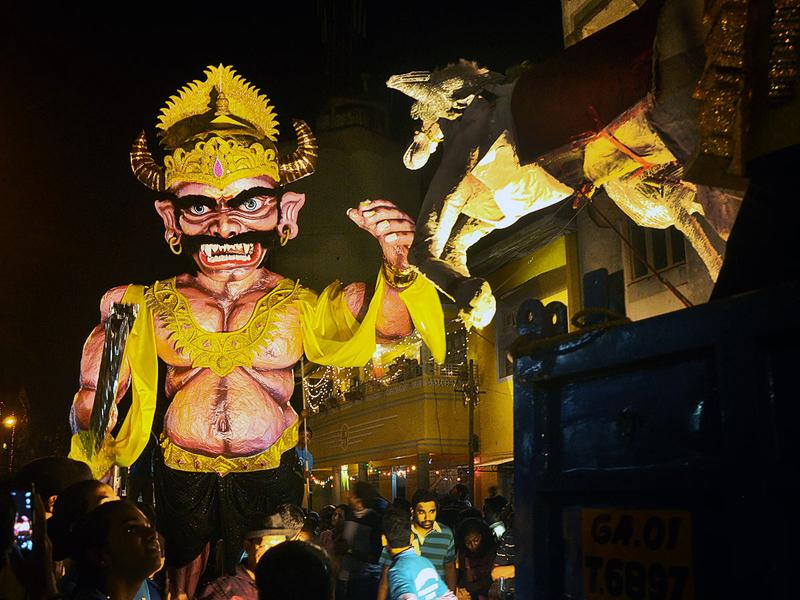 One can enjoy watching the most playful and live huge puppet show during this procession as there are people who create moments by holding the strings and the rods connected to the effigy of Narakasura. Lord Krishna the role played by young boy kills Narakasura by using his weapon discus at the end of this procession. 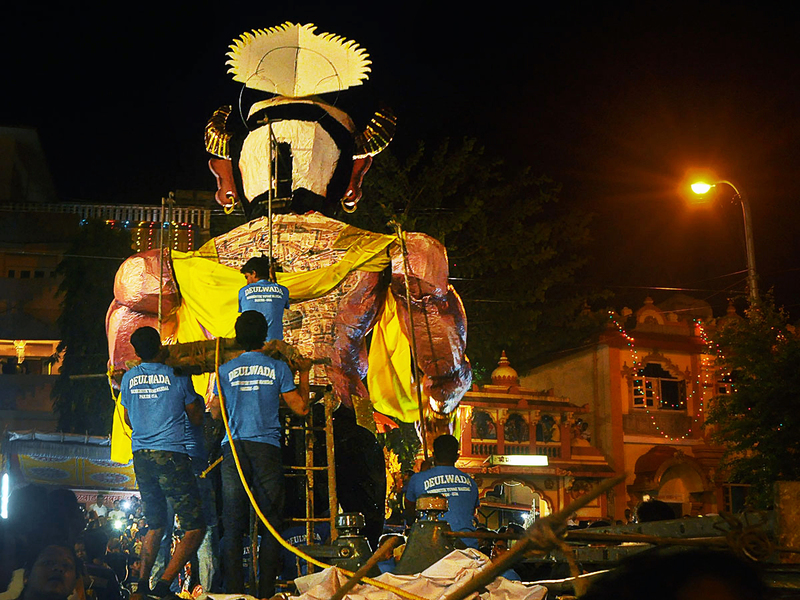 Varieties of huge, fierce looking, creative and innovative effigies of Narakasura can be seen in the completion. 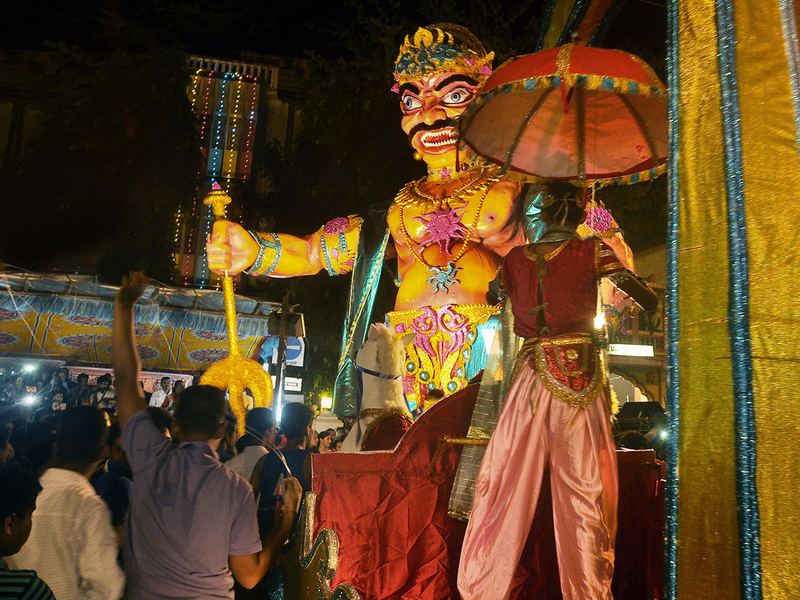 The procession takes place on the main roads of the cities of Goa. Some time the size of Narakasura effigy is so huge that minimum four to five people need to carry his head as soon as Lord Krishna beheads Narakasura in the scenario during the procession. These effigies are creatively painted and made of lightweight material like paper, straws, hay, padding and sometime thermocol. Creating these huge and tall straw effigies is not easy. It takes at least 10 days of workmanship. Materials have to be gathered, the design needs to be worked out creatively and finally the actual making needs to be implemented. People of all ages work in this creation, the older people provide guidance and the youth takes up the responsibility. 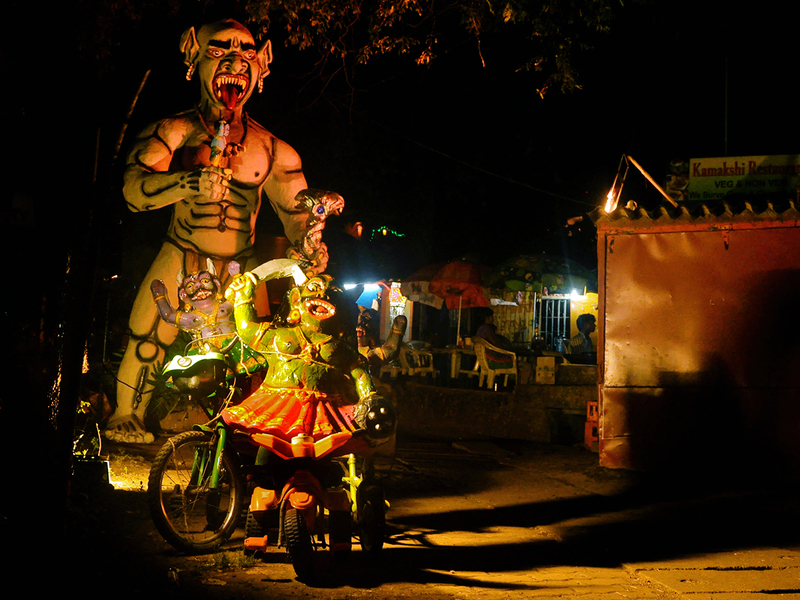 In Goa, people in every neighbourhood build their very own Narakasura for this festival. In the cities of Goa, a straw demon can be spotted at approximately every 100 meters and in the villages at every 500m. 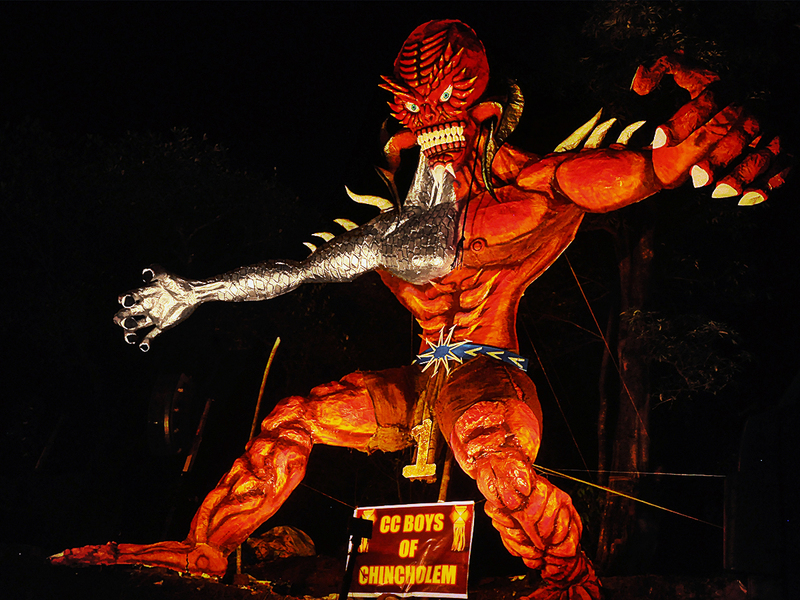 People use hay, sticks, paper, metal, clothes, glue and firecrackers to create these effigies. 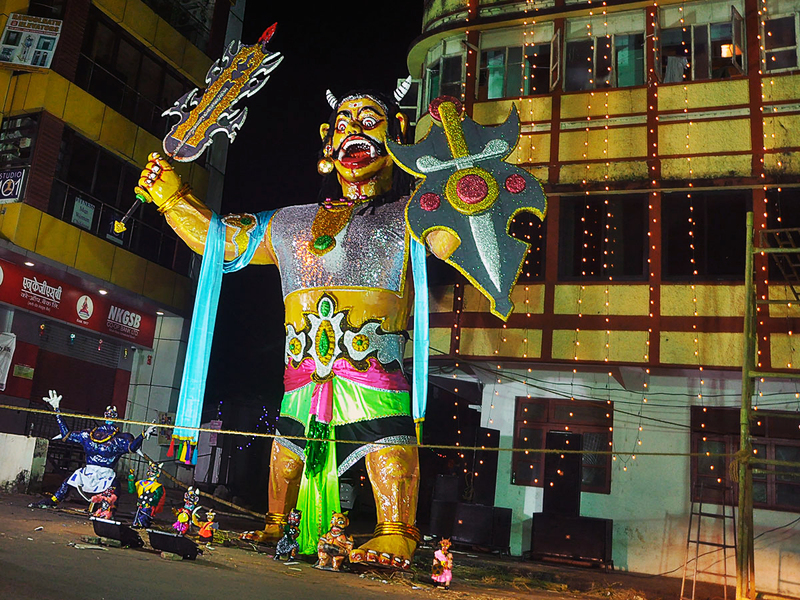 To show the powerful and strong demon the artists use vibrant colours and make it look well-built huge Narakasura, which gives the impression of evilness. The impression of Narakasura on human mind is the same but when it comes to creating it in a physical form everyone have their own innovative ideas to express it in their creativity. So the variations in every effigy can be found during this festival. Every corner is crowded with groups of young people, some planning and building the huge Narakasura, others just enjoying the festive spirit. The colours used while creating these effigies are vibrant and strong for the naked eyes to be spotted from the any corner or the distance. These effigies of Narakasura are not only in huge size some of them are also small in size and innovatively created in different getup and attire. 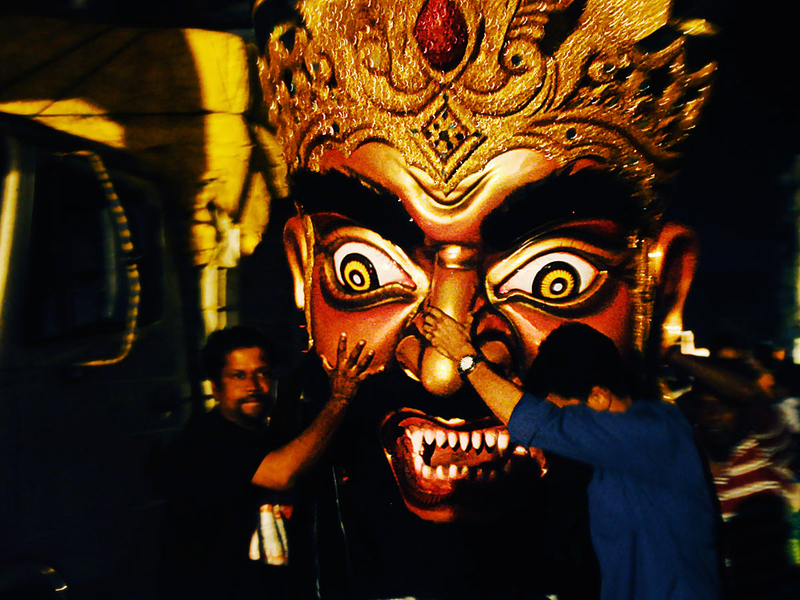 While creating effigies of Narakasura, the artist changes the look and feel but the evil expressions remains the same. Naraka Chaturdashi also known as Naraka Nivaran Chaturdashi is the Hindu unique folk festival celebrated in all over India, which falls on the second day of Diwali. According to the Hindu mythology, the demon Narakasura was killed on this day by Lord Krishna. There are many legends related to the festival of Diwali in India. 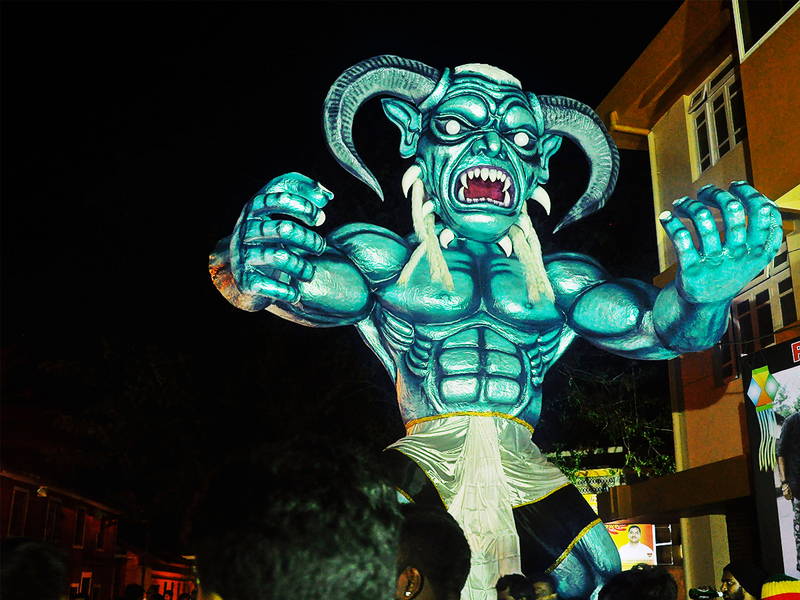 However, in Goa, the legend Narkasura is the reason for the Diwali celebrations. Lamps with four wicks are lighted at various places. Diwali in Goa is marked by Naraka Chaturdashi, in which the effigy of Narkasura is then taken in a procession and hence begin the festival of Diwali by burning it at dawn amidst a lot of firework display. In Hindu mythology, Narakasura or Naraka, the third avatar of Lord Vishnu is the demon son of goddess Bhudevi and Varaha. Lord Vishnu granted the boon desired by Mother Earth for her son should have a long life, and that he should be all powerful. Narakasura became evil, got addicted to power and usurped some of heavenly mother goddess’s territory by kidnapping 16,000 women. After unsuccessful attempts of killing Narakasura by many gods, Lord Krishna beheaded him with his weapon. Before break down, the Narakasura requested a boon that his death anniversary should be celebrated by all people on earth. This day is celebrated as 'Naraka Chaturdashi' - the day before Diwali. 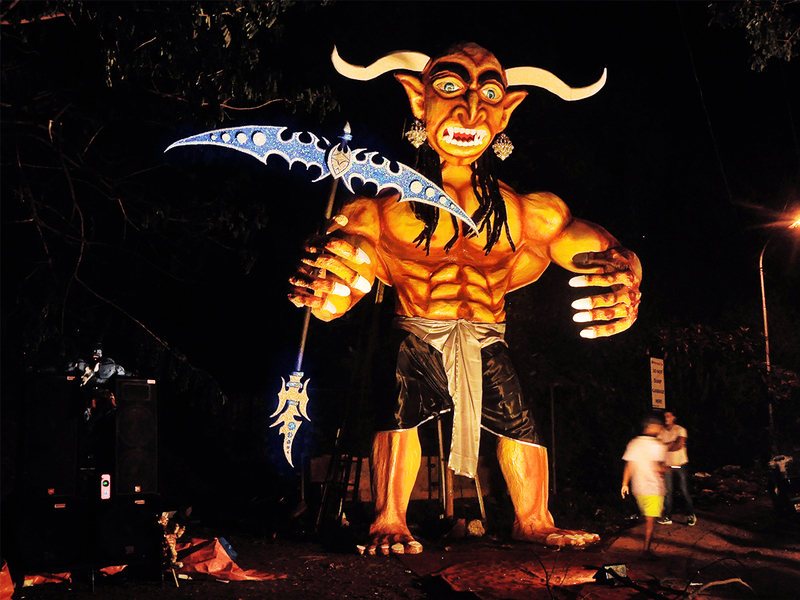 To celebrate the Naraka Chaturdashi, Goan people make huge effigies made up of grass and waste paper and filled it with crackers. 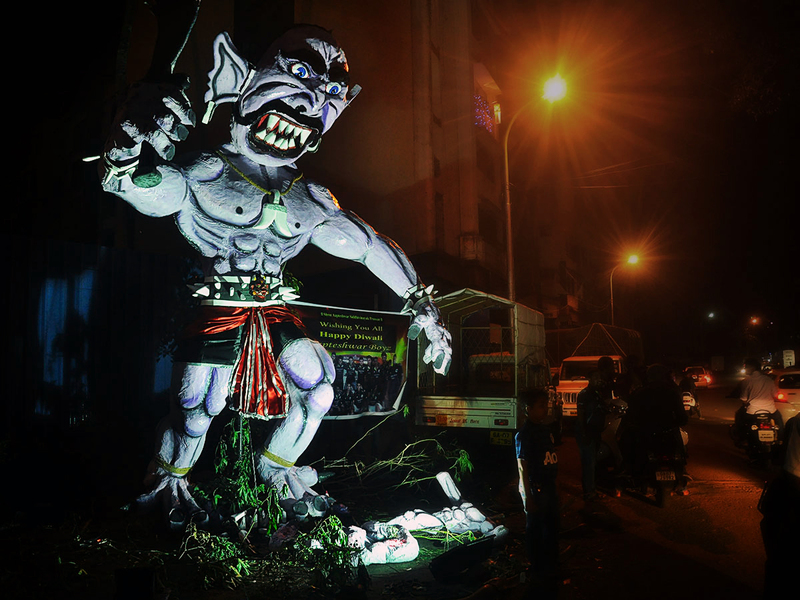 A lot of money is spent on making these effigies as some institutions conduct Narakasura competitions and announces cash prizes for the best one.